Preheat the oven to 350 degrees F and line 24 cupcake tins with paper liners. Microwave the chocolate on high for 45 seconds then stir gently to melt. It’s okay if there are a couple unmelted pieces; the residual heat will melt them. Cool chocolate to room temperature. Combine flour, baking soda, and salt in a small bowl. With an electric mixer, beat together the brown sugar, eggs, butter, espresso powder/ground coffee, and vanilla extract for 3 minutes until smooth. Beat in the melted chocolate until well mixed, then beat in half of the flour mixture. Beat in the buttermilk, then the remaining flour mixture. Beat a minute until smooth. Fill each cupcake tin 2/3 – 3/4 full and bake for 10-15 minutes, or until a toothpick comes out clean. Cool completely on a wire rack before assembling, otherwise the frosting will melt! Mix the espresso/coffee powder with the milk to dissolve the powder. Beat the butter with an electric mixer and add the powdered sugar. Beat in the coffee-milk and vanilla extract until the frosting is fluffy and smooth. There will be some leftover. Spread it on toast or something. I’m sure you won’t have trouble finding a use for it! Heat cream in a saucepan over medium-high heat until it is steaming (not boiling! Too hot and the ganache may not turn out). Remove from heat and add chocolate. Let sit five minutes, then stir SLOWLY to melt the chocolate (stir too fast, like I did the first time around, and you’ll end up with a grainy, clumpy mess). Stir in the butter until melted. Let cool a bit. Fill a piping bag (with a 1/4 inch round tip) with the coffee frosting. Stick the pipe tip about halfway into a cupcake (you may have to wiggle it around a little to make a little cavity) and squeeze to fill the cupcake with frosting. Fill all of the cupcakes, making sure you have enough extra to make the little Hostess squiggles at the end. If any frosting is poking up from the cupcake cavity, wipe it off. Holding a cupcake upside down, dip it in the ganache, then flip it right-side up once it’s covered. Gently move it from side to side or tap it on a table to help the ganache distribute evenly. If you try to spread/smooth it with anything, it won’t look as lovely and smooth. 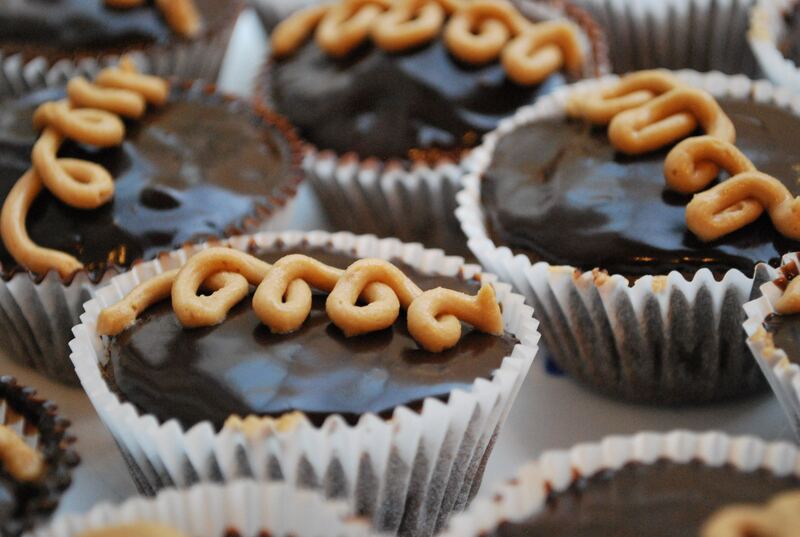 Ganache-ify all the cupcakes, then stick them in the fridge for a few minutes to set. Using a small round piping tip, pipe the Hostess squiggle on top of the cupcakes using the coffee frosting. If your first few look bad, it’s okay. You’ll get better. And then you can eat all the mess-ups for yourself.